The Ideal Introduction to Coding!! All my kiddies have enjoyed learning to code online, starting with the 'drag and drop' boxes. Over the past year DS6 has mastered this method. Today, however, we have taken coding to another level! They got to see their code in action through the movement of Botley, the coding robot. 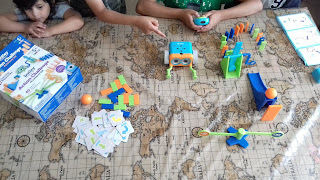 It gave the younger ones a basic understanding of coding, utilising step coding and logic. 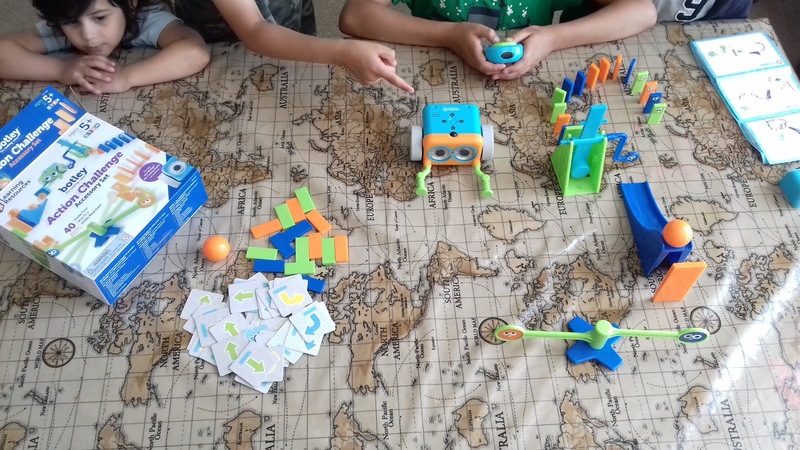 Aimed at ages 5-9 years old, Botley encouraged DS6 and DS9 to use their critical thinking and problem solving skills whilst programming and having fun making it chase a ball, knock down their Lego and spin around in circles! 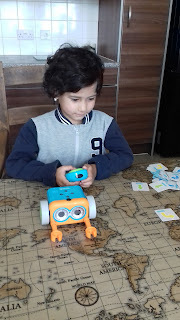 DD3 even got involved and enjoyed creating simple sequences inputting them into the little programmer and transmitted it to Botley which carried out her commands as it rolled around the room making different sounds. Even DS12 couldn't resist a go! The Activity Guide was very handy to get us started. 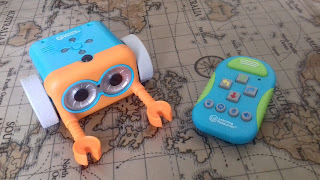 Not only does it give you all the usual information, such as introducing Botley and how to insert the batteries etc, but it also explains how to use and code in a very basic way. It even taught the kiddies how to code some hidden features which were fun, and it provides a web link for more tips, tricks and hidden features! The younger ones enjoyed programming simple sequences, whilst the older ones planned more complex ones, programming up to 80 steps in just one sequence! Check out Botley in action over on our Instagram page and Insta Story here. 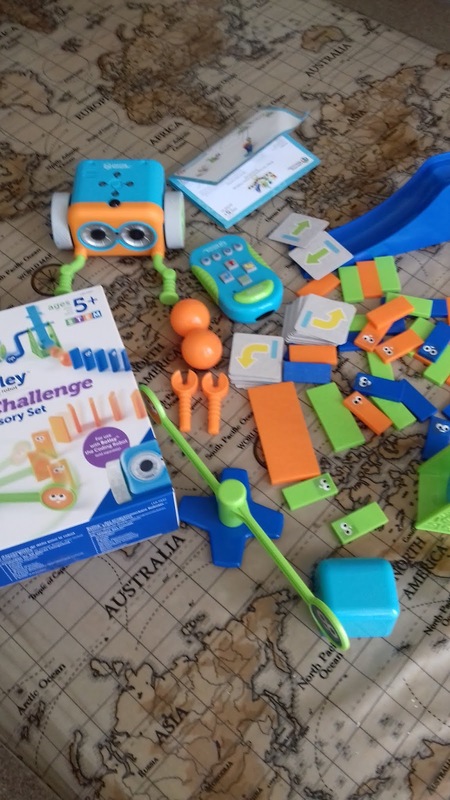 The Action Challenge Accessory set was a lovely addition to our coding fun. It consists of falling dominoes, swinging hammers, rolling balls and more physics-inspired accessories. I am sure Botley enjoyed his new toys as much as the kiddies enjoyed setting up his obstacle courses. The kiddies found its words and sounds very amusing, especially when Botley sneezed! 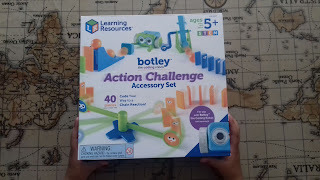 The set also comes with a guide challenge which the kiddies used to set up a course for Botley. They also planned and set up their own chain reactions which Botley navigated through. This set comes with a different pair of detachable arms in order for him to 'push' and 'knock' the different toys he came into contact with. There are many great things about Botley, not only is it a child-friendly, durable robot but it's 100% screen free! No smartphones or tablets are required! All it requires is 3 x AAA batteries and the programmer also needs 2 x AAA batteries. Inserting the batteries before set up was super simple and quick, so make sure you have these to hand as well as a small cross-head screwdriver! 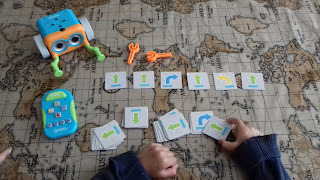 DS6 thought up his own coding sequence, laid out the coding cards and then programmed his sequence before transmitting it to Botley, in order to see it in action. This helped him plan as well as visualise the path Botley would take. 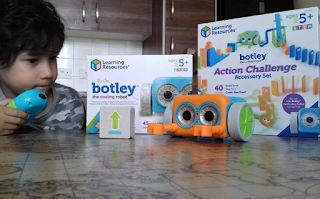 With our action packed Sunday afternoon playing with Botley, taking him on a never ending obstacle course adventure, we also discovered that he features LED lights on the top which show the direction of each step and a special sensor underneath! Just draw a black line and he will follow it! The kiddies couldn't wait to try this out and drew a thick black line on white paper so see if it would sense and follow it. 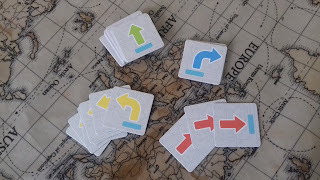 These 40 coding cards are great to have on hand for the little ones to lay out their desired coding sequence! DS6 enjoyed getting to grips with Botley and all the fun he could have with it. He easily learnt how to program it to move things around as well as using the 'detect object' function. Using the If/Then function is a way to teach robots how to behave in certain conditions. He programmed Botley to turn right if he detected an object. DS6 had lots of fun watching Botley dodge all the fruit he laid out! 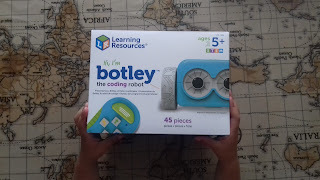 We think Botley is an amazing coding companion for younger children to learn their basic programming skills by learning through play and watching Botley follow the instructions they give him. Older siblings can join in the fun and make longer, more complex sequences for Botley. 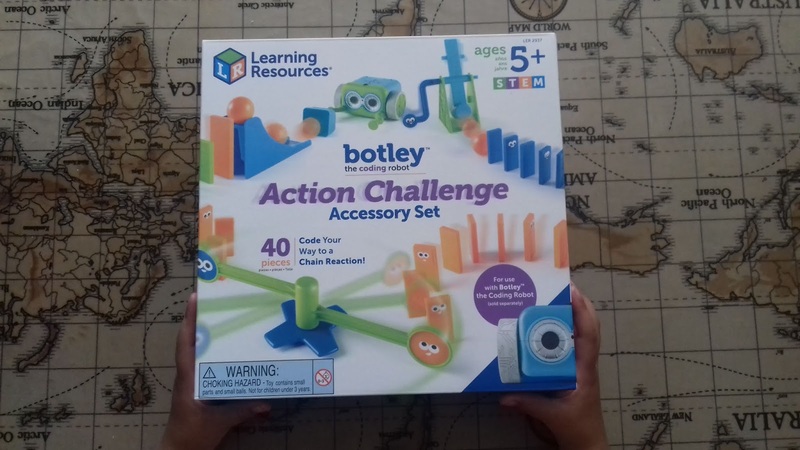 Each time they use Botley they discover something new he can do! There are many different tasks which he can carry out from detecting objects, following lines and terrific tricks! He is very funny too with his silly sounds and words, certainly an 'attention grabber' for the younger ones! The only downside now is that the kiddies need to learn to share it, as they all want to play with Botley! For more information or to place an order please check Botley out here! Disclaimer: This post contains affiliate links. We were sent this educational product in order to review and all opinions are my own.